Northwest National Real Estate: New Listing! Western Montana Cabin For Sale! New Listing! Western Montana Cabin For Sale! Just like new 1 bedroom cabin with off grid generator power system. Cabin comes ready to move in with furniture and even silverware. Inside of cabin is clean and bright with kitchen, dining living area, bath and bedroom. 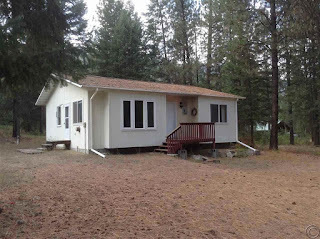 The outside sits on just over an acre lot with RV hookup, private well and septic. Close to Quinn’s Hot Springs and a short walk to the Clark Fork River. Make this your fishing recreational headquarters. This is a great spot for family recreation and fun. Lots of room for RV's and camping right on the property. Also, near 14 Mile Boat Launch. Call Spangler Real Estate at (406) 649-0109 to schedule an appointment. Priced at $109,000.